Why Mickey Mantle? 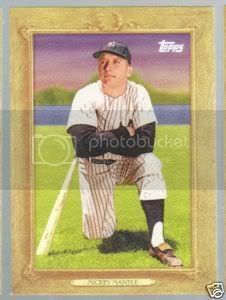 When I decided to number these custom cards I knew right away that card # 7 had to belong to Mickey Mantle. Mickey's had hundreds if not thousands of new baseball cards released over the past few years. I think this might have somewhat diminished his allure. 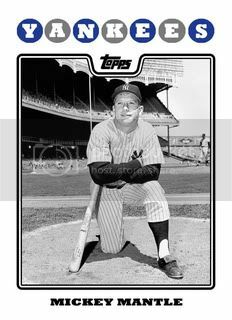 I know I don't get excited any more when I pull another Mickey Mantle card out of a Topps pack. Okay I did get a little excited when I pulled his Turkey Red insert from a 2010 pack recently. Regardless of that, he is a New York Yankee legend. Like most kids his age, he was one of my dad's favorite players while he was growing up. Even though I'm too young to have seen him play, I'm a fan of his too. I've seen the Yankees specials on the MLB Network and have watched the 61* movie. It still doesn't get better than Mickey Mantle. It was great to see Rich Harden out in Surprise, Arizona wearing a Texas Rangers uniform. 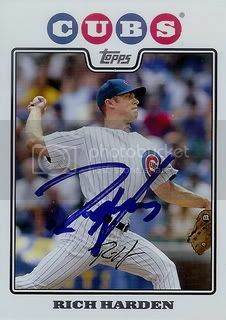 I've been a fan of Rich's since his days with the A's and was excited to hear he'll be leading the Rangers rotation in 2010. 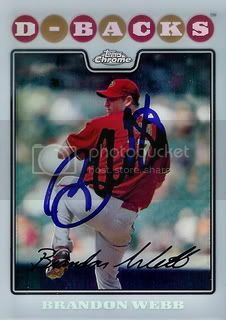 If Rich had been healthy since his MLB debut in 2003 he would be one of the top 5 pitchers in all of baseball. Instead, he has continued to find himself on the disabled list. When he's pitched, he's managed to win 50 games and put up a career ERA of 3.39. Pretty good for a guy who has spent most of his time in the American League. The Rangers are my pick to win the World Series this year. In order to increase the probability that this will happen, they'll need a full season out of Rich Harden. 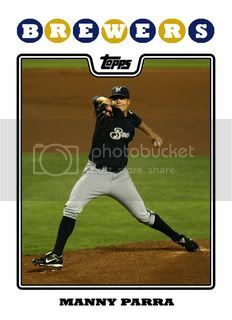 Well... exactly one year has passed since I began My 2008 Topps Set Blog. Please join me in having a celebratory piece of imaginary Arizona Diamondbacks cake. Enjoy! 2005 National League All-Star Chad Cordero is working on a comeback with the Seattle Mariners. He's been injured since the 2008 season but it seems like he's ready to compete for the M's closer role. I was a little surprised to see Seattle Mariners pitcher, Erik Bedard out practicing last week. I know Erik is injured and not due to comeback until the beginning of summer. It was good to see him out there. I was excited when the Mariners traded for him a few years back and will be rooting for him to dominate opposing batters again like he did in 2007. 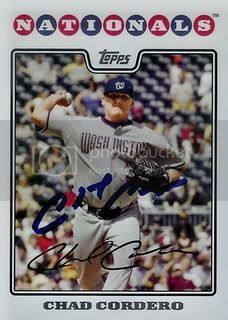 I don't know a whole lot about Seattle Mariners reliever, Garrett Olson. He seems like a really nice guy and as a left handed reliever he will be one of the keys to the Mariners bullpen this year. Another new Mariners position player showed up to camp early. Like Ryan Garko, Eric Byrnes will be fighting for a starting job this spring. Eric put up HUGE numbers in 2007 but hasn't been able to match that success. He was a fan favorite in Arizona and I'm glad to add this card to our set. Felix Hernandez was the main reason we chose to visit the Mariners on the first day of Spring Training. 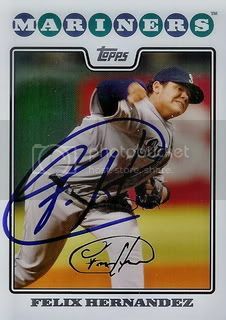 He was an All-Star for the first time in 2009 and finished for the AL Cy Young Award behind Royals ace, Zack Greinke. This is definitely one of the highlights of our set so far. Thanks, Felix! 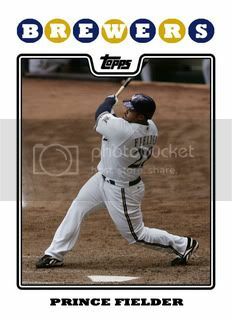 After a week's hiatus, Custom Card Sunday returns with Milwaukee Brewers slugger, Prince Fielder. Why Prince Fielder? You hear alot about some of the other National League first basemen ( i.e. Albert Pujols, Ryan Howard ) but Prince is "quietly" establishing himself as one of the premiere power hitters in all of baseball. There really isn't much Prince Fielder hasn't done during his short MLB career. He is a two-time All-Star. He's led the league in both home runs and runs batted in. In 2007, he became the youngest player to ever hit 50 home runs in a season. He even won the 2009 Home Run Derby. 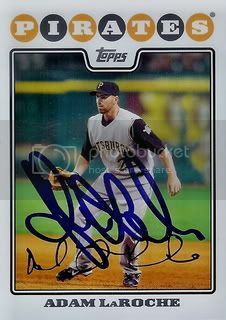 The second card I was able to get signed on Thursday was from another new Seattle Mariners player. Even though the hitters aren't due to report to Spring Training until next week, former Indians and Giants first baseman, Ryan Garko was already out in Peoria getting his work in. Ryan will probably spend most of his time coming off the bench but he is one of the many small additions the Mariners have made that could push them to the top of the AL West this year. 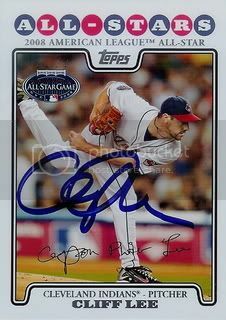 The very first autograph I was able to get yesterday was of new Seattle Mariners pitcher, Cliff Lee. Can't go wrong with starting the spring off with a Cy Young award winner. 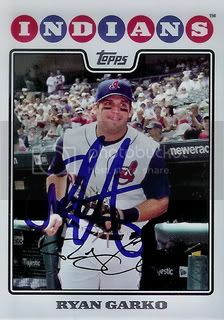 Obviously I was very happy to get Cliff to sign his All-Star card from the 08 Topps set. 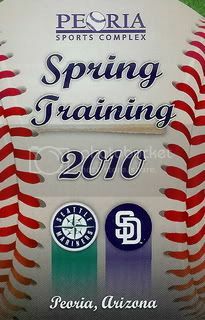 Having Cliff along with Felix Hernandez and Erik Bedard is going to make the Mariners dangerous in 2010. Before I get started with what could turn into a month and a half of Spring Training successes ( fingers crossed ), I thought I'd share my redemptions from the Topps Million Card Giveaway. 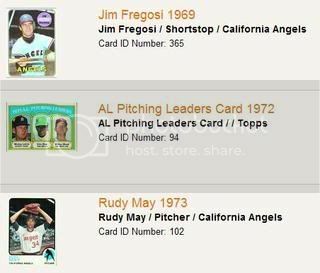 Nothing too exciting but I was surprised that all three of the cards were from 1973 or older. Better than a 1988 Topps Ed Lynch. Today reminds me of that song "It's the Most Wonderful Time of the Year." Yah it's a Christmas song but isn't the first day of Spring Training practices almost as good as Christmas morning? Maybe better? Later this morning I will be stopping by the post office to mail off my first batch of Spring Training TTM autograph requests on my way to the Peoria Sports Complex to officially get Spring Training 2010 started. 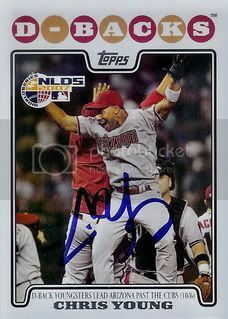 I did manage to walk away from the Diamondbacks Fan Fest with a few autographs on cards that weren't from the 08 Topps set. Great day overall. Thank you to the DBacks for putting this together and a special thanks to the players who all of the players who signed autographs for us this year. 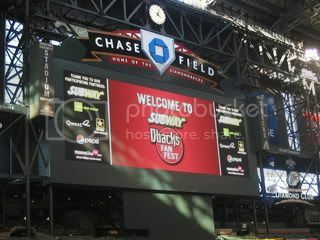 I can't wait DBacks Fan Fest 2011! 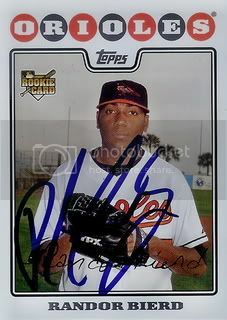 This is the tweflth and final 08 Topps-related card we got signed at the 2010 Diamondacks Fan Fest. I couldn't be happier with how they all turned out. Yep, more Chris Young. Another nice looking card from the 08 Topps Opening Day set. 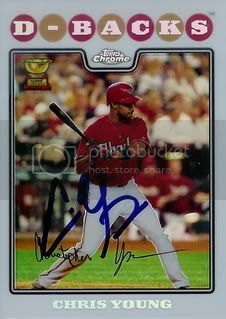 Chris Young's second card from the 2008 Topps base set is post season highlights card. In case you forgot, the Diamondbacks had the best record in the National League in 2007. The team was led by Randy Johnson and Brandon Webb on the mound and emerging stars like Orlando Hudson and Eric Byrnes. They defeated the Chicago Cubs in the NLDS and lost to the Colorado Rockies in the NLCS. During that season Chris Young became the first rookie in MLB history to hit 30 home runs and steal 25 bases. 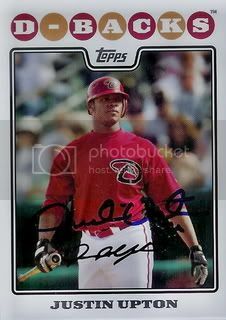 Another player I was hoping I would be able to get a few autographs from was Diamondbacks outfielder, Chris Young. Mainly because Chris has two cards in the 08 Topps set. First up is his regular issue from series two. Good looking card here featuring Chris after another DBacks win. It even has rookie cup trophy. What's not to like? 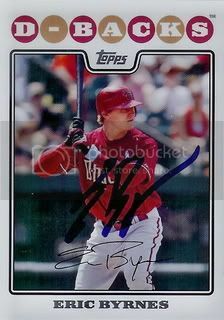 The final card Brandon Webb signed for us at the DBacks Fan Fest on Saturday was an 08 Topps Chrome Refractor. I was very pleased to get everything I needed Webb to sign done in one day. Any time you can get four autographs from a Cy Young Award winner, it was a good day. 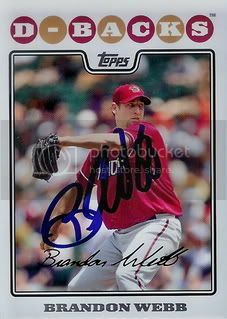 Brandon Webb has had the honor of being the Diamondbacks starting pitcher on Opening Day four times. 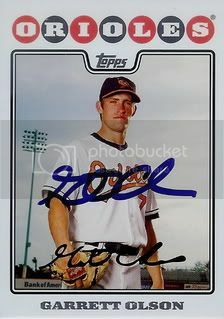 Seems like the perfect guy to sign his 08 Topps Opening Day card. 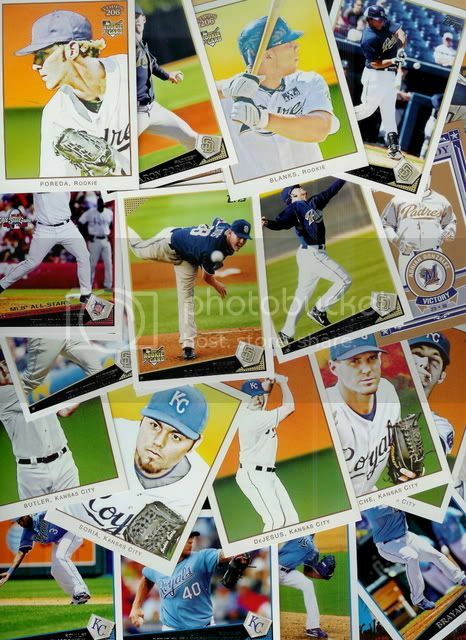 The 08 Topps Opening Day set in general is just okay. The red border was an interesting choice but for the DBacks players it works well with their senora red jerseys. 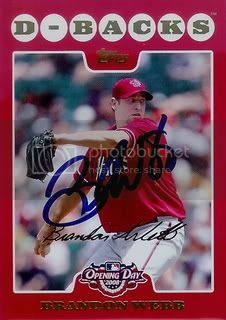 Brandon Webb is a 3x All-Star so it's great to add his 2008 Topps All-Star card to our collection. If the Diamondbacks are to have any chance in the NL West this season, they'll need Brandon to return to his All-Star form. I think there's a really good chance that will happen. 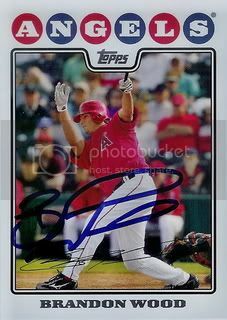 Another Fan Fest goal was to get Brandon Webb to sign his two cards from the 08 Topps set. 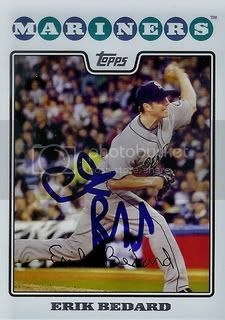 I've gotten Brandon's autograph before but only once since he won the Cy Young Award in 2006. Since then he's turned into a perennial All-Star and is one of the best Diamondbacks players of all-time. 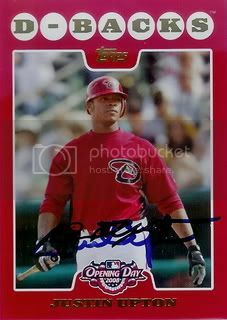 Definitely had to thrown down another $5 donation to DBacks charities to get our first 08 Topps Opening Day card signed. Who better to start these off with than Justin Upton? Nice card. Justin did kind of sign right over the facsimile signature but it still looks great. I couldn't be happier. Justin's already establishing himself as one of the top players in the league and he'll still only be 22 years old on Opening Day. One of my main goals for yesterday was to get Justin Upton to sign a few cards. As you can see below, we were successful. 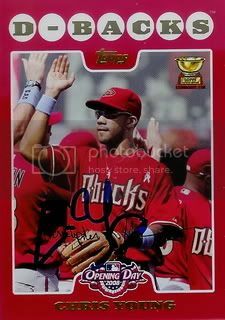 It's great to be able to add another 09 All-Star to our set and one of our favorite DBacks players. Thanks, Justin! In addition to Adam LaRoche's base card from the 08 Topps set, we were also able to get him to sign his Refractor from the Chrome set. Sweet! 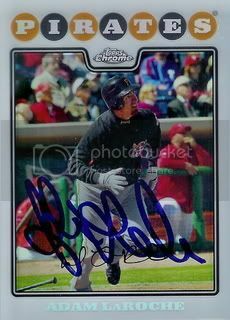 This is our first signed Refractor card. 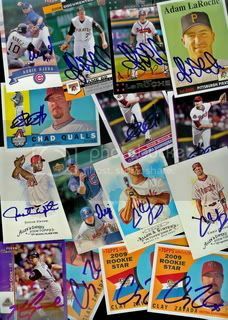 Don't be surprised to see a few more over the next few days as I get caught up with the rest of the cards we got signed today. Just got back from a long day at Chase Field. Today was the sixth annual DBacks Fan Fest. 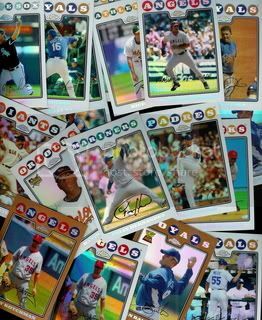 I woke up at 6am this morning with one goal in mind, getting as many 08 Topps cards signed as I could. We did pretty well. We were able to add six new cards for our set plus some other good stuff. Not sure where to start so I'll begin alphabetically with the 08 Topps cards. First up, new D-Backs first baseman Adam LaRoche. Got a great package in the mail yesterday from JD's Wild Cardz. He sent me a bunch of Royals and Padres cards from the 2009 T206 and U&H sets. These are my first 09 T206 cards. I'm really impressed. Definitely looking forward to getting a few of these signed during Spring Training. If you're not already a reader of JD's Wild Cardz, today is a great time to start. He has an interesting Winter Olympics contest going on right now. Check it out! Little known fact: I do collect cards other than 2008 Topps. 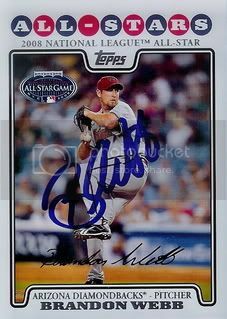 A friend on SportsGraphing.com was able to get former Orioles pitcher Randor Bierd to sign an 08 Topps card for our set at the Pawtucket Red Sox recent Hot Stove event. 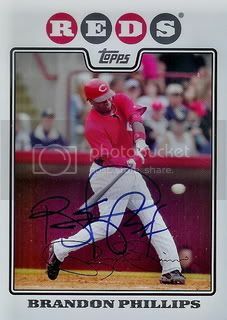 Randor, who is now with the Red Sox organizaion, was there signing autographs along with other Sox prospects including Casey Kelly, Ryan Kalish, and Junichi Tazawa. 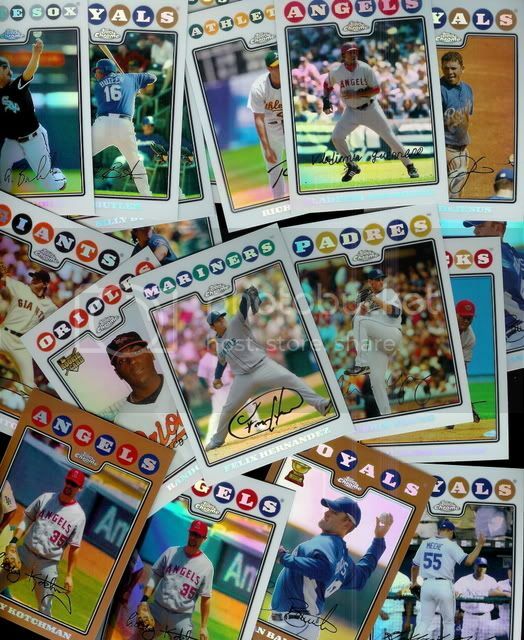 Q: How many Refractors are a "Buncha Refractors"? A: In today's example, eighteen. All from a recent purchase and all from 2008 Topps Chrome. Today's mail brought a signed card from Tampa Bay Rays first baseman, Carlos Pena. 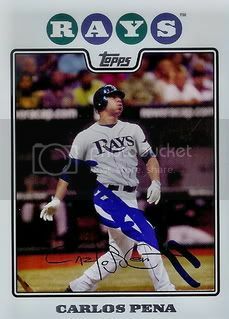 After subpar seasons in Texas, Oakland, Detroit, New York and Boston, Carlos resurrected his career in Tampa and was named 2007 AL Comeback Player of the Year. It's great to be able to add another All-Star to our 08 Topps set. Why Manny Parra? Who doesn't like "Handy" Manny Parra? Okay I don't think that's his official nickname but maybe it will catch on. As a parent to a toddler, we spend a lot of our time watching Playhouse Disney. My son's favorite show is Handy Manny so I wanted to make a custom card of our favorite baseball player named Manny ( sorry Manny Ramirez ). In all seriousness, I like Manny Parra. He's put together a few decent seasons in Milwaukee. However, they really need him to step up in 2010 if the Brewers are going to do anything in the NL Central. Historic mail day today. We got our first custom card signed. I couldn't be happier with the way this turned out. 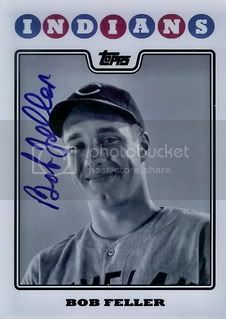 Less than two weeks ago we sent Hall of Famer, Bob Feller two copies of the custom card we made. He graciously signed one and kept the extra we offered him. Thanks, Mr. Feller! Zach from Autograph Cards sent us a nice package last week. 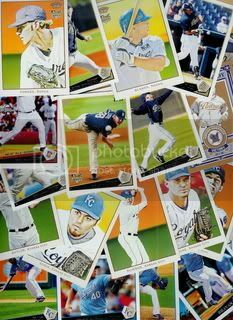 It included two 08 Topps cards he got signed at this year's Royals Fan Fest. 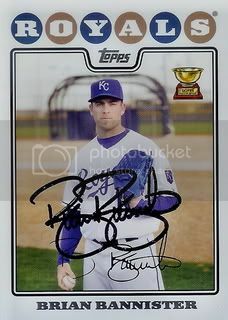 The second card was of Royals pitcher, Brian Bannister. A quick Google search just taught me that Brian is the oldest son of former All-Star pitcher Floyd Bannister. Thanks for the great cards, Zach! Go Royals! 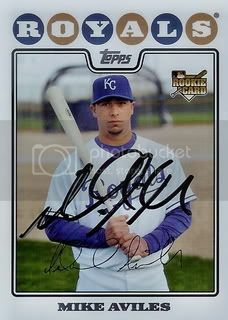 The first card was of Royals shortstop, Mike Aviles. Injuries limited his playing time during 2009 but I remember he put up some big numbers in 2008. I even had him on my fantasy baseball team for most of the season. Took Brandon Wood a little while to send this one back to us but I'm glad he did. We sent Brandon an autograph request back on April 22nd and received this card signed back today. Thanks, Brandon! Best of luck in 2010! Found this one in the same box that had Mark Reynolds. 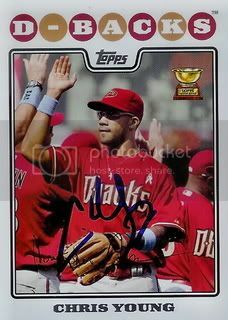 This was another TTM success from 2008 before we officially started working on our 08 Topps set. I don't think there are any other surprises lying around but who knows?